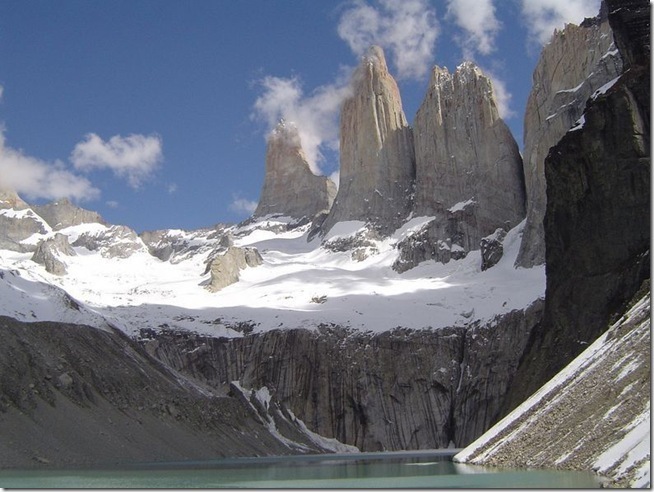 Torres del Paine or Towers of Paine are three massive granite pillars jutting out some 2,800 meters above the Patagonian steppe at South America's finest national park, 1,960 km south of the Chilean capital Santiago. These breathtaking spires are flanked by the summit of Paine Grande (3,050 m) and the sharp tusks of black sedimentary peaks known as Los Cuernos (The Horns). Aside from these spectacular granite spires and mountains of the massif that dominate the landscape, the national park also encompasses ridges, crags, glaciers, waterfalls, rivers, lakes and lagoons.